Today, I’d like to bring your attention to another indie game that’s been around for a while – one which might well be one of the most beautiful metroidvania-style games I’ve ever played. It’s called Aquaria, and it puts you in the shoes of a young mermaid-like creature by the name of Naija. 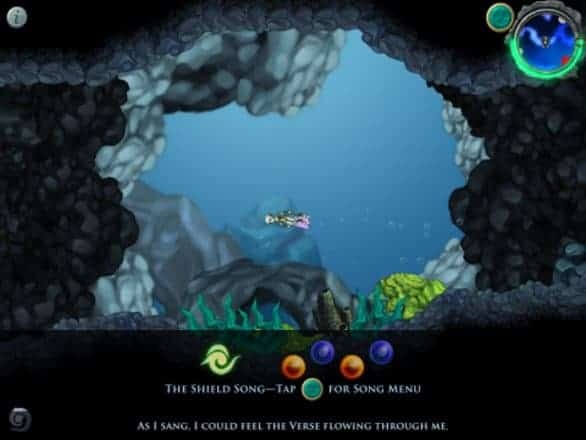 Naija is the last of her kind, adrift in a vast underwater world filled with the ruins of long-forgotten civilizations. For much of her life, she’s wandered the depths completely ignorant of what she is, completely unaware of her intellect. Then, one day…her life changes. She ends up encountering a strange, cloaked figure which opens up her mind to the world. From there, she sets out on a grand journey to explore the ruins of ages long past in hopes of eventually finding out who – or what – she is, and perhaps discovering what happened to her people to destroy them. The waters aren’t necessarily safe, however: she’ll encounter a vast array of frightening, dangerous, and downright horrific creatures drifting through the deeps. In order to protect herself against these creatures, Naija is equipped with a very powerful weapon: her voice. Naija’s power is in the songs she sings – using either the mouse or the keyboard, the player can bring up a whole array of musical ‘notes’ which can be sung in sequence. Depending on the sequence Naija sings, a number of different effects may occur. She can shield herself from harm, move large objects, and even polymorph her body into new and powerful variants. Of course, these sequences need to be unlocked through exploration of the vast underwater kingdom, which is more or less entirely free-roaming: though there are bosses and an overarching plot, there’s actually very little to keep players from exploring the world and doing things exactly as they want. As much as it’s possible for a game of this kind to be open, Aquaria is. There’s also a crafting system which allows you to create food to give yourself various bonuses or heal the damage Naija takes. That’s not what defines the title, though. As I’ve said, virtually everything about Aquaria is positively beautiful. The music is incredible, the graphics, though simple, are incredibly well-designed and quite easy on the eyes. Even if you don’t play this one for the gameplay, at least try it for the experience: it’s stunning, and I guarantee you won’t find yourself disappointed.